Welcome to the 26th issue of "Shut Up and Mangia!". This issue will focus on the region of Calabria and Calabrian cuisine. Calabria is located at the toe of the boot of Italy and is covered by hundreds of miles of beautiful coastline. It is also the home of magnificently, high rugged mountains and wooded areas. Calabria’s subtropical climates produces olives, figs, chestnuts and citrus trees along with a very special orange called arancia calabrese. This orange, which is prized for it’s skin, is boiled and candied and sent all over Italy for use in pastries. Even though there is plenty of tuna, sardines and swordfish coming from the sea and the gulf, pork and other meats are dominate in this county along with homemade pastas. The cuisine of Calabria represents some of the very best of Italy. Here I will feature five of my favorite Calabrian recipes for you to try at home. Also, a couple of great books on Calabrian cooking and a few great travel sites about Calabria just in case your planning a vacation. 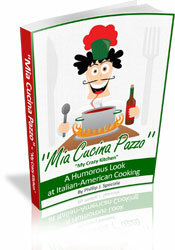 I would like to take this time to thank everyone for purchasing my new ebook "Mia Cucina Pazzo". The success of this book means a great deal to me and the feedback has just been terrific. I’m so glad everyone’s enjoying the book as much as I’ve enjoyed writing it. Thanks again. If you haven’t downloaded a copy of "Mia Cucina Pazzo" just yet, click here and you will be able to view the full table of contents before purchasing. Also, the contest page has been turned back into “Your Recipes” page. Please continue to send some of your great Italian family recipes. Here are two books featuring some of the best recipes from Calabria. The first book Cucina Di Calabria: Treasured Recipes and Family Traditions from Southern Italy (Cookbooks) by Mary Amabile Palmer, gives you more than 200 Calabrian dishes you can prepare at home plus many stories about Calabrian culture, history and traditions. The second book, Sapori Di Calabria by Emilia Fusco, is filled with authentic family recipes, featuring appetizers and pastas to main dishes and desserts. If your planning a trip to the beautiful region of Calabria or just want to learn more about the region, then these two sites will be very helpful. The first site is Italy World Club.com.This site will give you a good idea of what the region is all about. The second site is Italian Visits.com. This is a great travel site featuring Calabria among other regions in Italy. Here are five great Calabrian recipes for you and your family to enjoy. The first recipe is a simple Calabrian Eggplant appetizer followed by a classic Pasta with Sausage and Ricotta. Then we have a Chicken Calabrese followed by a delicious Calabrian Style Swordfish. And for dessert a traditional Chocolate Covered Figs. Enjoy! Here’s an off subject place I just have to tell you about. If you live here in Chicago or planning a visit, you must stop by The Joynt located at 650 North Dearborn. If you enjoy some great music in a relaxed atmosphere, then this is the place for you. Read my review about The Joynt an you’ll see what I mean. It’s a fun place to be.